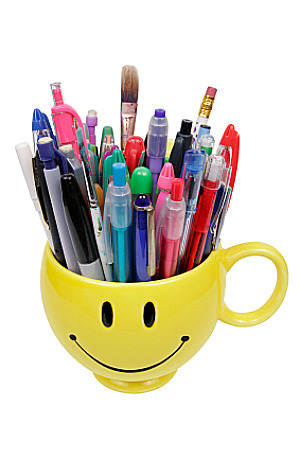 I wrote "Pens in a Cup" just for fun after I stumbled upon a cup filled with pens in a corner of a basement room. I simply started thinking about pens and got poetic. It won't change the world; but I hope you enjoy reading it. 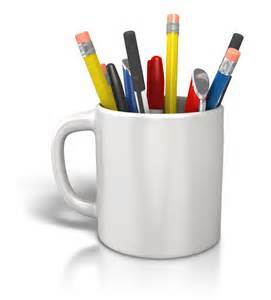 Cup, this morning I saw you in the corner of the basement, loaded with old pens. How long have you sat there? It’s anyone’s guess. There is much in the scene; you look lonely and lost. I can’t hear them but if the pens could talk, it would be surreal. I imagine their tales are like dreams; but if they came to life, I could ask of their themes. I would join them in delight and hear their stories. Did you help a child learn the three R’s? How many simple scribbles and silly doodles did you sketch? Did you mark some contracts and bound the undersigned? How many groceries and other items did you list? Were there any short stories or maybe an exam or two? Did you speak of love and sorrow? How about a thesis or a theory? Did you get the spelling and grammar right? Did a politician use you to mark a bill into law? How many checks did you sign? Did you help a bard, share his rhymes? Clicky pens you replaced quills and fountain tips. You roll ink on a ball and smear it on a page. How clever! But now you sit idly in the dark. Did the computer upset your scheme? Now people can write, even on screens; how is it that you still exist? You can be carried in a pocket or purse. But it’s only time before you join the shorn. Pens, who put you inside the cup and forgot you? Had you been of gold or silver, you'd still be free. There are so many of you and I guess you slipped. Luckily you still whisper into history’s ear! It hears your tales of wonder and fame!